It was a mixed performance for the draft squad this week as we continue to look up at the top spot in the 8-team league. 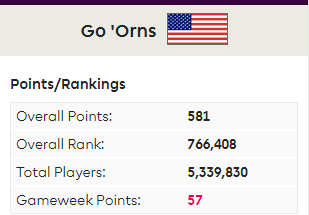 A final score of 53 points saw my move 19 points close to the top spot, now trailing by 49 overall points, I feel confident I have a good squad to make that ground up. As for Gameweek 11, we enter the break in form and will look to make a few transfers to shore up a questionable defense. I might have to look at swapping out my bench, as I got caught with 2 players who didn’t start this weekend, but only one available off the bench. The waiver wire was very kind to me this weekend, as I picked up Nick Pope, Charlie Daniels and Kiko Femenia, all of whom started. Pope has been playing very well for Burnley and posted a season high 9 points on a CS, 3 saves and a bonus point. It was a good time to bring Daniels in, as Bournemouth kept their second CS of the season. Femenia was in and out of the BPS ranking much of the game, but 3 unanswered goals from Everton and he ended up with a single point. 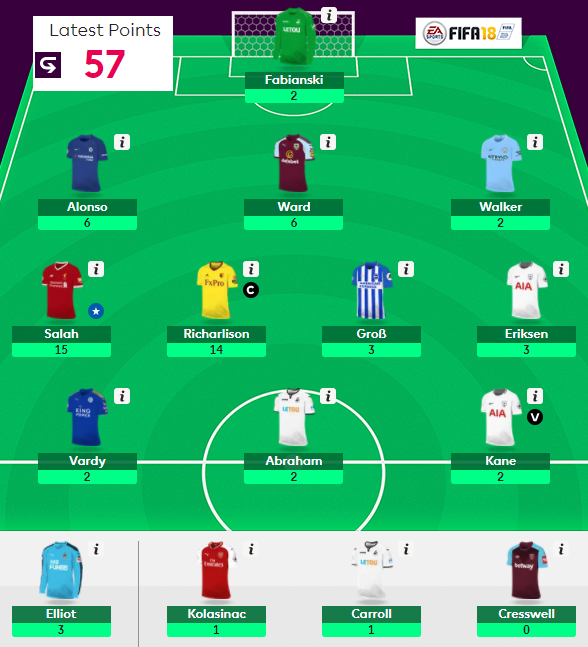 On the day, 15 points from three new players helped key my squad to their overall total. The midfield continues to struggle. Dele Alli didn’t start, Philippe Coutinho is still nursing a groin injury, but due back for GW12. 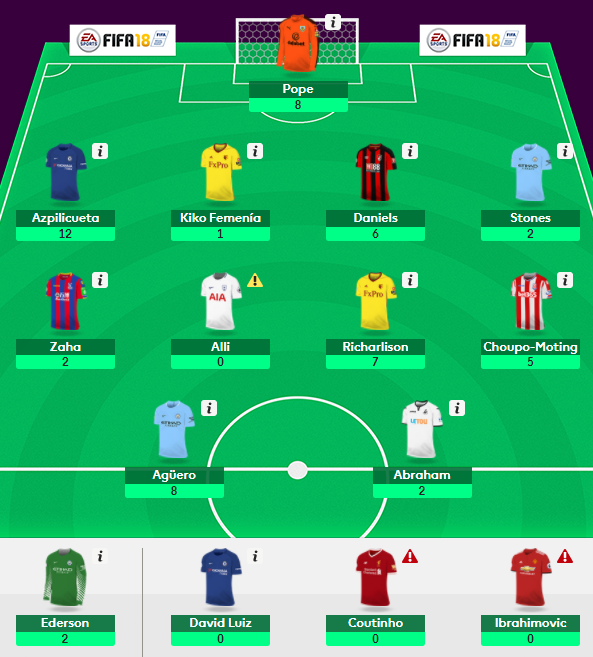 Wilfried Zaha struggled, as I knew he would, against Spurs this weekend but Palace looks great through GW19. Eric Maxim Chuopo-Moting returned another assists, giving him 3 on the season. Richarlison scored a goal, but was robbed of an assist as Cleverly couldn’t convert. A total of 14 points, modest return for my 4 midfielders. Up front, Sergio Aguero scored his 179th goal for City and returned 2 bonus points for 8 points. This week I partnered him with Tammy Abraham, who failed to return for the second time in 3 weeks. I still point to the midfield for my current struggles. Alli with just a single return in 5 weeks, as well as being injured for GW12 coupled with Coutinho out with the groin, it’s been tough going. Thankfully the defenders and forwards have help offset some of the pain. Richarlison and Chuopo-Moting have helped settle the midfield, but will be looking at Zaha with a run of good fixtures upcoming. Some question of David Luiz falling out of favor with Conte, but he failed to start in GW11. This brought Femenia into the starting XI. 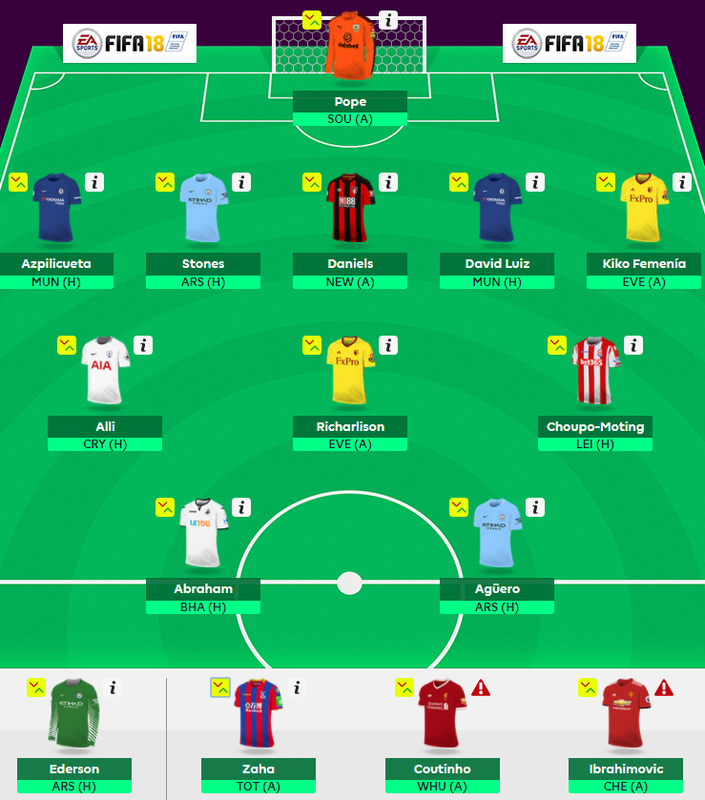 My final bench slot is filled by Ibrahimovic, who isn’t fit to play…yet. However it’s my plan to get him in early to take advantage of his potential. Not sure if I will retain the injured star or sacrifice him for a third, healthy bench player. 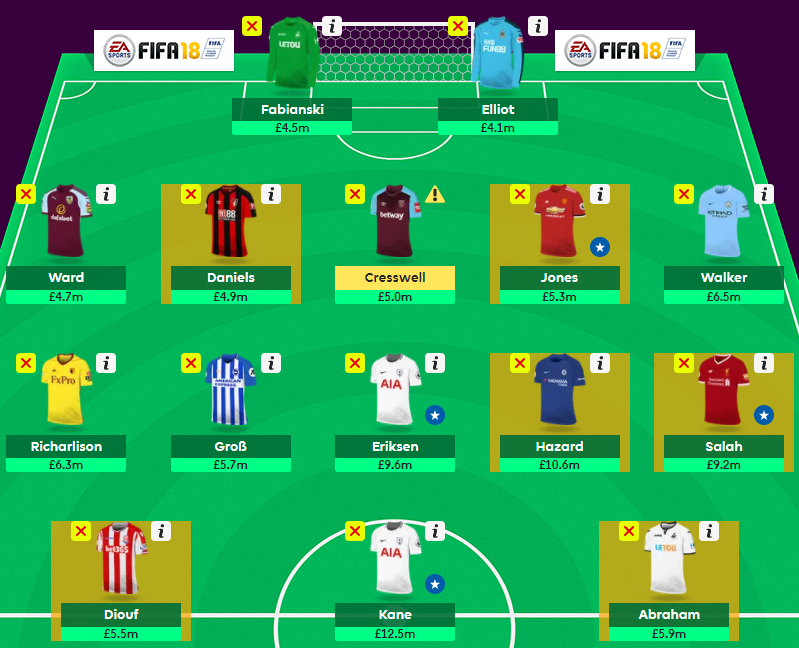 With the international break upon on, I will take a most of the 2 weeks before I figure out who to draft into my squad. It took just 10 weeks before I made the decision to take a -4 point hit last week. Looking ahead, the 5-2-3 formation is morphing into a 5-man midfielder, but it’s going to cost me a few points. 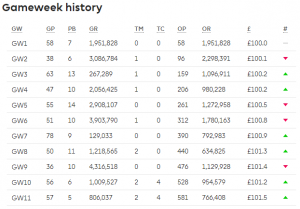 Last week started the dominoes toppling, which should continue through the international break, into GW11. Ideally, this would have been a great time to activate the wild card, but that played out in GW5. By shifting players now, I feel I am setting myself up for a run through December. 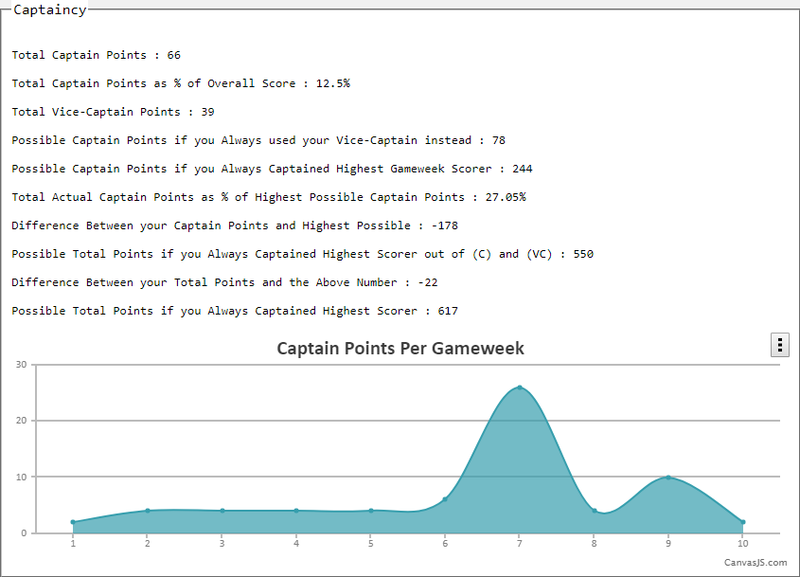 As mentioned in my Think Differently series at Fantasy Football Geek, formation hasn’t been the issue, captaincy points have. Not so much poor decisions, but poor performances from premium players wearing the armband. Putting faith in my 5-man defense paid dividends through 10 weeks. The 5-2-3 formation has outproduced both 5-3-2 and 4-3-3 through 10 weeks. Due to benched players and injuries, automatically substitutions changed my intended 5-2-3. Last week I lost faith in Ben Davies, transferring him for Stephen Ward. Burnley has a favorable schedule through GW16. While Spurs are solid through GW17, there is some risk of rotation, thus Davies was move, which helped free up my budget. The -4 hit came in the name of Richarlison, for Jack Cork. 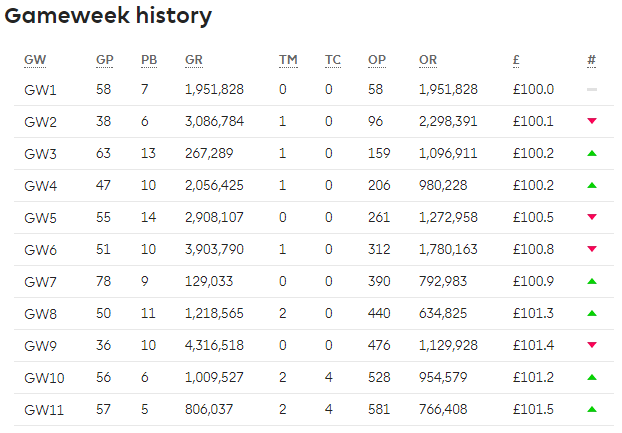 Unfortunately a 1 point return didn’t bode well but finished 4 points better than if I would have held the transfer. This week continue the trend as I look to take another 4 point hit in conjunction with my FT. While Jesus has played well, I am done with Pep and the rotation at City. His £10.5 price and that of £4.5 of Dale Stephens allow me to introduce Mohammad Salah and Tammy Abraham with £0.3 ITB. 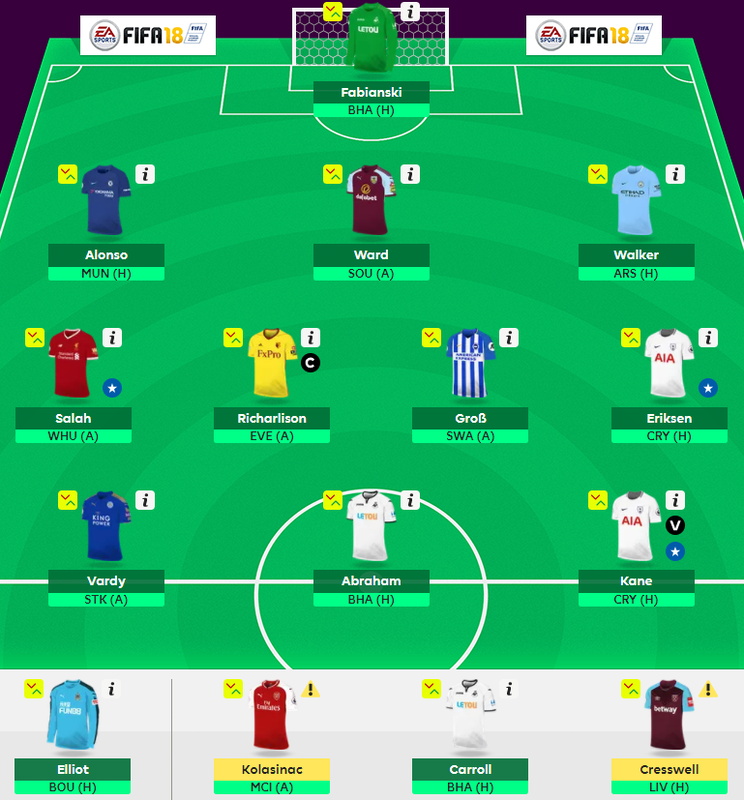 After the international break, I look towards GW12 and GW13 to continue the transition to a 5-4-1 (or 4-5-1). Hazard was going to be one of the first players in, but ends up being the last piece for GW13, based on fixtures. GW12 sees Marcos Alonso giving his walking papers in favor of Charlie Daniels, while Sead Kolasinac drops out for Phil Jones due to fixtures. These moves free up £2.4 to bring in Eden Hazard and Mame Biram Diouf to complete the change in GW13. The “Vardy Party” would be over and Tom Carroll would be sacrificed, but in return I would have a 15-man squad that all start for the holiday period, reducing the change of playing shorthanded.